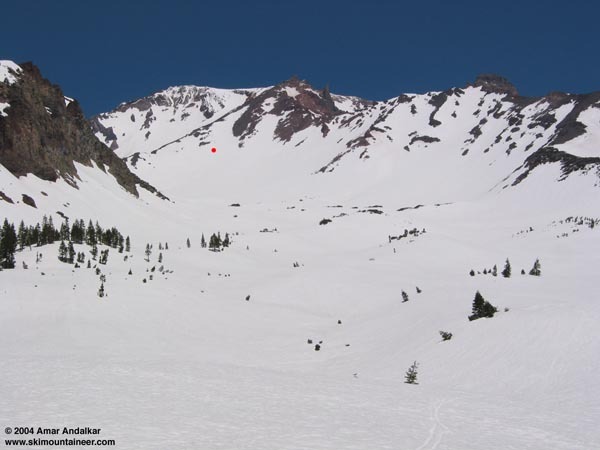 After a spectacular Monday skiing the Hotlum-Bolam Ridge and Bolam Glacier on the north side of Shasta (see trip report), I planned to head around to the SE side and ski the Clear Creek and/or Wintun Ridge routes. But first I really needed a day off, I wish I were in good enough shape to do back-to-back 7000+ vft days at elevation, but that certainly isn't so yet. I spent Tuesday resting and hanging out in Shasta City (the Snowcrest internet cafe has WiFi for $3/hr, not free, but OK). Then in the afternoon I headed east on Hwy 89 past McCloud to the Pilgrim Creek Road (FR 13) and the well-signed Clear Creek turnoff onto FR 41N15. This road is dirt, getting somewhat rutted and muddy near snowline, and this time the USFS website was correct, it was blocked by snow 3 miles from the 6500 ft TH (5 miles up from FR 13), at 5400 ft before the junction with FR 31. Well that stunk, 8800 vft to the summit and all the extra miles. Even worse, the view of the route from the road revealed that there was almost no snow on either the Clear Creek or Wintun Ridge routes above 11000 ft, the recent high winds had blown it all away. Ugh, three years in a row, the same thing has happened to me on the SE side of Shasta, each time the snow has been gone long before the road is open to anywhere near the TH. The only continuously skiable route is to go from the standard Clear Creek route into the bowl below the Watkins Glacier, then head right (north) around the glacier to cross Wintun Ridge at 11200 ft onto the Wintun Glacier, and follow this all the way to the top via the east side of the summit block. Anyway, the road blockage and route conditions, along with the forecast for an 8500 ft freezing level and high winds (50-60 mph at 14000 ft), convinced me that an alternate plan was in order. Hopefully I'll be back to ski that continuous line in a few weeks, after the road opens to the TH. I headed back to Shasta City in disappointment, ate dinner, and drove up the Everitt Hwy to Bunny Flat (6900 ft). Several other skiers were hanging out, but all were planning to head up the standard Avalanche Gulch route (none planned to summit). Having skied that route and several of its variations numerous times, including just 3 weeks earlier, I figured I'd have to try something different. The Old Ski Bowl on Shasta's south side provides a ton of fine skiable terrain reaching up to 11800 ft, but since it lies completely outside the Wilderness it is usually overrun with snowmobiles. I thought that midweek in May, I had a good chance of avoiding the stinkers. Ominous clouds obscured the entire mountain throughout the evening and provided some serious doubts about tomorrow, but by 9pm things had begun to clear and the nearly-full moon was shining through. The next morning dawned beautifully crisp and clear. I got a leisurely start, chatting it up with the other skiers but failing to convince any of them to head to the Ski Bowl. So I skinned up Green Butte Ridge at 8am and within minutes had complete solitude, eventually breaking out above treeline with a nice view down into Avalanche Gulch and the tiny forms of other skiers and climbers. I skinned firmly frozen SW facing snow up to Point 9365, deskinned, and skied the steep SE facing slope 300 vft into the Old Ski Bowl, softened to very nice corn at 10am. Snowmobile tracks and high marks were everywhere, but thankfully the detestable machines remained absent all day. I reskinned and headed up the still-frozen snow of the western part of the bowl, reaching 10300 ft just after 11:30am. The slope slowly but continually steepens, and skinning became difficult, above this point foot crampons would have been the way to go. Although skiable snow still reaches to nearly 11500 ft (nice and steep, probably nearing 40 degrees), on this day with an 8500 ft freezing level it was unlikely to ever soften into corn. Even at 10300 ft, the snow probably needed another hour of sun, but since I needed to drive 550 miles back to Seattle, it was time to ski. I skied down at noon, the snow was still somewhat firm on south aspects, but turning to corn on SE-facing rolls. Below 9000 ft, everything was very nice corn, and fast GS turns brought me quickly past the east face of Green Butte to treeline at 7600 ft. I skied right past the snowdepth gauge for the USFS Mount Shasta Avalanche Center, finding out later on the web that the current snowdepth was a respectable 113", still above-normal, but well off the seasonal maximum of 201" recorded on Feb 26 (see my newly updated Cascades snowdepth page). I skied down a gully through the woods to rejoin the snowcovered Everitt Hwy at 7400 ft and quickly skied the 1.5 miles back down the road to Bunny Flat. Overall, it was a nice pleasant short day, with peace and solitude found just over the ridge from the busy climbers' highway of Avalanche Gulch. No match for the amazing trip of 2 days earlier, but 3700 vft of nice spring corn and plenty of daylight left for the long drive home. This photo looks back up the Old Ski Bowl from near treeline, with Green Butte at left and the upper part of Avalanche Gulch visible behind the upper Ski Bowl at left center. The red dot approximately marks the point I skied down from at 10300 ft. Click here for an enlarged version of this photo. Yet another fantastic TR informative and inspiring. Thanks!